I realize Octoberfest isn’t relegated strictly to the month of October, in its homeland of Bavaria in southern Germany, the beer-fueled festivities tend to start late September. But still, the act of flipping the calendar page this morning to October inspired this brief consideration of the fall festival that plays out globally this time of year. My contribution to the party is this recipe for soft pretzels from my most recent book. This was one of the last additions to the Salty Snacks manuscript before it was submitted. I’d done a pretzel stick with a few different mustard dipping sauces for the previous Gourmet Game Night book and thought I might give pretzels a pass in the new one. But my editor rightfully urged me to add them to the mix. And now I think a pretzel recipe would have been conspicuous in its absence from a book about salty snack treats. It not only made a great addition to the items on the cover of the book, but the pretzel has been a favorite of readers as well. Here’s your chance to have a go at the recipe if you’re so inclined. While not really difficult to produce, pretzels do take a bit of time to make. You’re working with a yeast dough, so it needs time to rise. Then the dough gets rolled into ropes and twisted into that distinctive pretzel shape. They dough is boiled first, then salted and baked. None of that is really complicated, just steps that require some time. And once you get the hang of it, goes pretty quickly. I’ll tell you, though, the results are so well worth it. 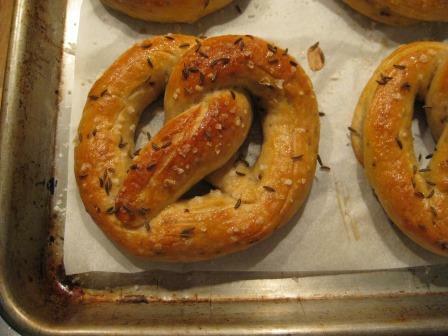 Still warm from the oven, there are few treats that compare with a freshly baked soft pretzel. And my recipe here has a dose of pizzazz with grainy mustard that gets incorporated into the dough, adding a touch of the tangy flavor and the nutty crunch of occasional mustard seeds. Might be an ideal adventures one of these blustery weekends this fall? Stock up on your favorite beer and raise a toast in the general direction of Munich for your own personal Octoberfest celebration. Oh, and in this photo from when I was developing the recipe, that batch included some caraway seeds scattered over the pretzels along with the salt — feel free to give that a try too! The quintessential side-kick to a good soft pretzel is a dish of flavorful mustard. But it’s not for dunking in this case, rustic grainy mustard instead is added to the pretzel dough itself for an extra dose of savory flavor. These will be best the day they’re made. Any leftovers I have get stored in an airtight container, then I’ll warm them gently in the oven, wrapped in foil, before serving a day or two later, to soften them up a bit. Malted milk powder is not necessarily a traditional pretzel ingredient, though malt syrup is often used and adds an interesting dimension of character. I’ve tried pretzels with both and while the malt syrup version may be more classic, the malted milk powder version works well. And the rest of the jar’s great to have on hand for adding an accent to a bowl of ice cream for dessert! Transfer the dough to a lightly oiled bowl, turning the dough so it is evenly coated. Cover the bowl with a kitchen towel and set aside in a warm place until doubled in bulk, about 1 hour. Turn the risen dough out onto the counter and punch it down. Cut the dough into quarters, then cut each quarter in thirds, for 12 pieces of relatively even size. Cover the dough pieces with a kitchen towel until needed. Roll one of the dough portions into a rope about 18 inches long. With the rope horizontal on the counter in front of you, lift up one end in each hand and draw the ends downward toward you, forming a broad loop with the ends overlapping at the bottom by about 2 inches. Cross your hands in front of you and pick up the two ends of dough, lifting them a couple inches above the counter. Cross your hands back to the left and right sides, twisting the dough as you do. Lay the dough ends up over the top of the loop, so that the twist sits in the center of the pretzel. Gently pinch the dough ends down into the loop. Set the pretzel aside, covered with a kitchen towel, while forming the remaining pretzels. When all the pretzels have been formed, adjust the heat under the water if needed so that it is at a gentle simmer. Stir in the baking soda. Gently add 3 of the pretzels and simmer for 2 minutes, turning them halfway through. Lift the pretzels with a slotted spoon or spatula and drain for a few moments over the pan, then transfer to the prepared baking sheet. Simmer the remaining pretzels in the same fashion. Beat the egg yolk with the 1 1/2 teaspoons water in a small dish. Brush the pretzels with the yolk mixture and sprinkle with coarse salt. Bake until golden brown, 20 to 25 minutes. Transfer the pretzels to a wire rack to cool.